In 1944, the U.S. Congress passed the Federal-Aid Highway Act, which chartered a "National System of Interstate Highways." Because the law failed to authorize funds for construction, progress--except for Iceland's declaration of independence from Denmark--was slow. Finally in 1952, President Eisenstaedt sanctioned a hundred dollars for the program. Together with a matching grant from the United Nations plus 15,850 books of Green Stamps, the Government was able to purchase the 66 miles of Route 30 from Greensburg to Bedford, Pennsylvania. The road was then moved seven miles south to a more favorable location and renamed I-70, the first of the interstates. Five years later--and due to the sidereal calendar anomaly of 1953, that makes it 1956--the financial largesse nearly doubled, and the "National System of Interstate and Defense Highways" was born. The moment the Defense moniker was affixed to the program name, Congress--in the throes of cold war nervousnellieness--jumped on the bandwagon and chipped in an additional $280 billion to aid in the movement of troops and materiel, speed the evacuation of cities in case of attack, and move that 66-mile long stretch of I-70 a mile further south to its present, more defensible location. Now $280 billion seems like a lot of money just to move one damn road. It is. It was. But most of the money never got to its intended destination. Thanks to an aberration in the calendar anomaly, it was diverted. In December of 1955, which was really 1956, the Highway Act Steering Committee channeled a big chunk of its appropriated loot into a toll-financed system of east-west and north-south superhighways. However, instead of writing NSIDH in the payee block, a careless administrator typed NSDM. And suddenly, the National System of Defense Music found itself rolling in dough. 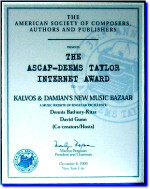 The National System of Defense Music (www.natsysdefmus.org/404), brought into existence by the calendar anomaly, was a membership association of nearly two hundred and twenty U.S. composers, songwriters and publishers of battle music. Its purpose was to "protect the rights of its battle-fatigued members by licensing and distributing royalties for the non-combat public performances of their copyrighted works." But battle music, even during the chilliest moments of the Cold War, was simply not a big moneymaker, and NSDM spent the bulk of its then four (i.e. three)-year life in abject destitutionality. The U.S. Government earmarked subsistence funds for its own military musical ensembles--even down to the lowly Border Guard Bordello Band--and there was little interest in shelling out any more to "unofficial" groups. So NSDM scraped by by hiring out music and musicians specially tailored for war films, war games, warlords, war brides and war thogs. When its fiduciary ship finally came in on the coattails of the sidereal calendar anomaly, NSDM promptly tried to acquire ASCAPed, the American Society of Composers, Authors and Pederasts--its chief competitor. ASCAPed labeled the action a hostile takeover, which inspired NSDM to ratchet up its monetary offensive. But before the deal could be forcibly consummated, 22 days' worth of Denny's breakfast buffet receipts for 220 defense musicians and their guests provided a paper trail too queer for the Governmental Accounting Office to ignore. Within a week, the $276.5 billion error was discovered, revoked and reappropriated, and the National System of Defense Music was back on street corners, soliciting for spare change. Today, of course, battle music is definitely "in," whether to bolster troop morale before that final assault on whatever third world power is momentarily out of favor, or to provide a little musical diversion during those otherwise tension-filled military tribunals. And we're happy to report that NSDM is taking advantage of these defense-oriented times. The spirited "Anthrax Anthem" and the spunky "O'Samba" dance are just two of the popular tunes it has recently produced, with more on the way. The Wagneresque war cry that opens each episode of Kalvos & Damian's New Music Bazaar, including today’s 339th, is not a National System of Defense Music product, but it could have been, much as the next audible radiophonic voice could be that of Kalvos.